“Scanners” is a new horror film made with enough craft and skill that it could have been very good, if it could find a way to make us care about it. I don't think it does. I never had the feeling during the film that it mattered much who won or lost, who lived or died, just so long as the special effects occurred on time and the movie's look of elegant chill was preserved. It was released at almost the same time as “Altered States,” another horror film that was being linked with “Scanners” in some reviews. I don't think they're comparable. I know “Altered States” cost many millions of dollars more than “Scanners,” but that's not the difference that matters; on the level of its technical credits, “Scanners” is a fully qualified thriller. What matters is that “Altered States” involved its characters in experiences that we believed (for the length of the movie) were really happening to them. Vicariously, they were happening to us, too. In “Scanners,” we're never involved. We're always watching. And so while “Altered States” throws all logic out the window and still works as great entertainment, “Scanners” bogs down in one of those plots where the big secret is revealed in the last reel and it turns out to be big only in the mind of the screenwriter. This was the fourth film by David Cronenberg, a Canadian who gathered a cult following for such superior low-budget chillers as “They Came from Within / Shivers” and “The Brood.” On the basis of “Scanners,” his reputation is overextended. We forgive low-budget films their limitations, assuming that their directors would reach farther with more money. 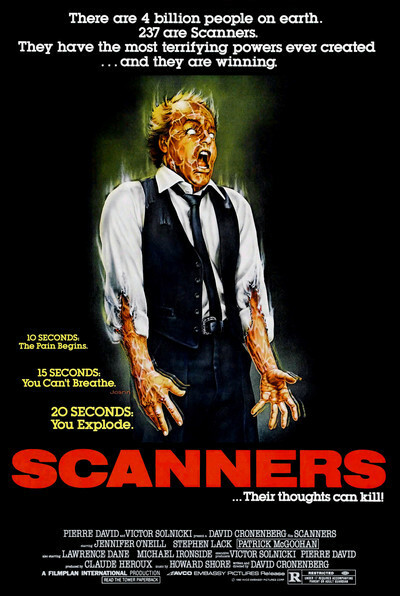 But “Scanners” seems to indicate that what Cronenberg wants is enough money to make a better low-budget movie. The film's story involves a breed of men and women who are "scanners," who can pick up the thoughts of other people, can enter their minds, and can mentally duel with them with such terrifying force that their enemies may literally have their heads explode. An interesting movie might have been made about the human plight of these mind-readers (what would it be like to be able to eavesdrop on the thoughts of every miserable straphanger on the way to work on the subway?). But “Scanners” doesn't get into the human implications very deeply. Instead, it gives us a ready-made plot that seems recycled from old “James Bond” movies and half-forgotten TV shows. It turns out that a large corporation has an interest in locating all living scanners, and using them for its own purposes. Two scanners (Jennifer O'Neill and Stephen Lack) fight for their independence. Their antagonists include an evil scientist and a good scientist, and of course everybody's motives are hopelessly entangled in the third act, even before the big surprise revelation. The problem with “Scanners” is really very simple: It is about its plot rather than about what happens to its characters. That is a big difference. Movies that are about their plots force their characters through their predestined paces. Movies that are about characters seem to happen as we're watching them. “Scanners” is so lockstep that we are basically reduced to watching the special effects, which are good but curiously abstract, because we don't much care about the people they're happening around.